Chance the Rapper bought out all tickets to the new movie "Marshall" at two Chicago movie theaters Friday and invited fans to join him for free. CHICAGO (WLS) -- Chance the Rapper bought out all tickets to the new movie "Marshall" at two Chicago movie theaters Friday and invited fans to join him for free. 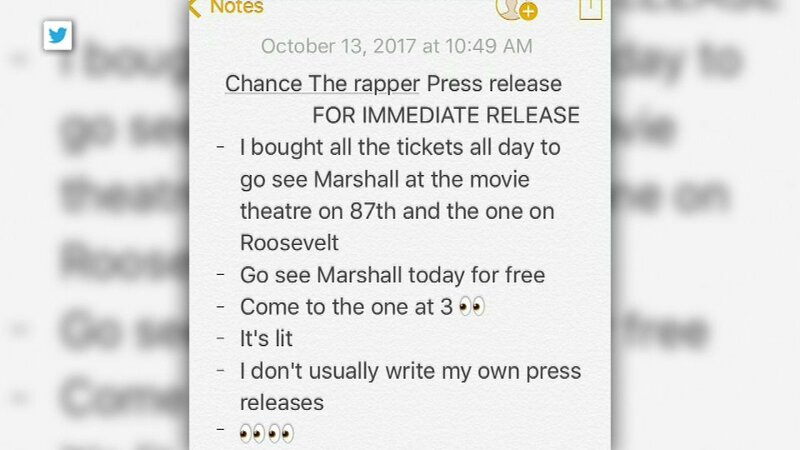 Chance bought tickets for the ShowPlace ICON Theater at Roosevelt Collection in the 1000-block of South Delano Center, and the Chatham 14 Theater in the 200-block of 87th Street. The rapper joked that he doesn't usually write his own press releases.